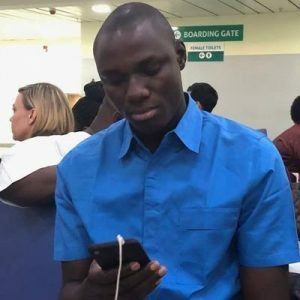 (News Investigators) /Concerned Nigerians besieged the Nigerian Police Headquarters in Abuja Thursday, demanding for the release of Samuel Ogundipe, a reporter with Premium Times. Even as the Police insisted that Mr. Ogundipe must disclose the source of his story. The journalist had written news story published by the Premium Times which revealed official communication from the Inspector General of Police, Ibrahim Idris to the Acting President Yemi Osinbajo. In the report, the Mr. Idris indicted the former director general of the State Security Service, Lawal Daura, for last week’s siege at the Senate. While the police did not deny the fact of the story, it arrested and detained Mr. Ogundipe Tuesday, demanding to know the source of documents for the published story. He was secretly dragged to court on Wednesday without access to his lawyer. However, protesters including rights groups gathered in Abuja Thursday to condemned the continued detention of Mr. Ogundipe as well as the decision to try him secretly, without giving him access to his lawyer. While addressing the protesters, Police spokesperson Jimoh Moshood said, “we are not saying tell us the source of your story, we are saying tell us where the document emanates from,” he said. On Thursday, Mr Moshood accused Mr Ogundipe of “theft of classified documents” used in writing the story. “It is factual to state that Mr. Samuel Ogundipe was arrested on the 14th of August, 2018 and on completion of preliminary Investigation, he was arraigned in a court of competent jurisdiction in the FCT in less than Twenty Four (24) Hours of his arrest. He was remanded to Police custody and the case was adjourned to Monday, 20th August, 2018,” he said in the statement. At the protest ground, Mr Moshood argued that Nigeria’s Freedom of Information law does not protect providing such information to the public. “Even the FOI Act limits access to classified information. The matter is already before the court and as a Nigerian he has the right to defend himself. But where a document that is classified goes out, we also have a duty to ask how it was leaked,” Mr Moshood said while speaking to journalists and other protesters. “What has happened will be investigated and we will take appropriate action and you (the media) will be involved. The spokesperson claimed that the Inspector-General of Police, Ibrahim Idris, did not order Mr Ogundipe’s arrest. “At all, the order didn’t come from the IG. People should disabuse their minds that the IGP ordered for his arrest,” the police spokesperson said. “Do you have his lawyer here? I am not aware that he was denied access to his lawyer and the court didn’t know he is a journalist. “I was not the prosecutor, I was not the investigator but I will go and get the fact from them. If the lawyer was not informed, me I don’t know. You’re just telling me. “If his lawyer is here, he can follow me so that we can meet the investigator. Everybody taken to court has a right to a lawyer,” he said.